If you want to make your own weighted blanket, you’ll be pleased to know that there are several materials you can choose as filler. And If you don't, but still want to know more about popularly used materials, read on. The most popular options are plastic poly pellets and glass beads, and sand (a budget choice). And we’ll get into more detail about them shortly. People have even gone as far as using metal weights and dehydrated organic food, but you can only imagine how uncomfortable or noisy that could be if it's not done right. There are many things to consider if choosing one, and they will influence more than just how heavy the blanket will be, or how should you take care of it. I’ll explore a few options so that you can make an educated decision on your preferred weighted blanket stuffing. What types of fillers are there for weighted blankets? 1 What types of fillers are there for weighted blankets? 2 What about weighted blankets filled with food? 3 Do you have to be careful with weighted blankets containing toxic chemicals? As said before there are 3 weighted blanket fillers that are most widely used; poly pellets, glass beads and sand, but there are also a couple more that you might see being used by some manufacturers. It's also good to know that some manufacturers stuff their blanket's pockets with cotton, to even out the filling and make it less lumpy, which I think is an excellent idea, but this increases the cost a bit. They are small round plastic beads with a pebble-like texture. They are commonly made from ABS virgin plastic which means they have not come into contact with toxins and other chemicals. Note that if you have skin or sound sensitivities, then this may not be the best option for you. A smoother texture may be better, like the one glass beads provide, for example. If you choose to use plastic pellets inside a cotton stuffing, it could help a bit with the noise they make, but be aware that they might feel a bit uneven if they aren't carefully constructed. Your blanket might end up being lumpy, and this could irritate you at night if you are sensitive to that type of thing. If you use minky or fleece fabrics with plastic pellets, you’ll have a softer texture due to the thickness of the material. You might still be able to feel the rougher texture of the pellets, but you won’t necessarily see it. These are one of the top-quality choices. These beads are extremely tiny and have a similar look and feel to white beach sand or salt crystals. They kind of make me think of Xylitol, you know, the fake sugar. They will appear much smoother inside your blanket too and are probably the best selection for people with any type of auditory, sensory and physical sensitivities. They are also a bit heavier than their plastic counterparts, and therefore you’ll need fewer glass beads to achieve your goal than you would with plastic pellets. Great for someone who wants weight but not an extreme amount of bulk on top of them. Steel beads are very strong, heat treated hyper-eutectoid steel micro balls. They're super easy to wash, as they usually don't retain a lot of dirt between them because of their smooth surface, and will just last about forever. These beads are slightly larger in size than glass beads but are heavier, so you’ll need even less of them in your blanket, making them perfect for really thin pockets. It's also great that, because they're bigger, it'll be harder for them to leak through the stitches of the blanket. The only drawback is that they can also be a bit lumpy and noisy. Sand is a somewhat decent (and very cheap) way of adding weight to your blanket or quilt, though it’s not the favorite, as it brings lots of problems. 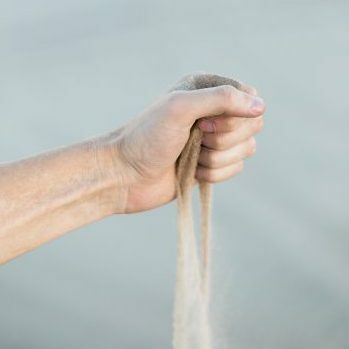 What you must know about sand is that it has some issues being a semi-organic material (unless it's some sort of processed desert sand, which may be better and costlier). Sand doesn’t spread out as easily as glass beads or plastic pellets, and it is much harder to wash and dry than the non-organic fillers. Sand will expand when it comes into contact with water and will bundle or cluster up inside the pockets of your blanket, causing large uneven bumps in your fabric. It will take an exponential amount of time to dry and depending on the fabric you use, and the construction of the blanket, they will leak more or less faster in the long run, so you probably don't want to wash sand-filled weighted blankets a lot. Weighted blankets constructed with sand are often some of the least durable, so be aware of that. I wouldn’t really want to sleep under a weighted blanket filled with rocks. Pebbles do however come in various shapes and sizes, and if you do wish to go this route, you’ll want to choose small stones that are the most uniform in shape and texture. If not, the consistency will be rough, lumpy and irregular, there will be a lot of clatter when you move around under your blanket, and it might be quite uncomfortable. What about weighted blankets filled with food? Yes, there are some great organic fillers you can use like dehydrated corn, beans, rice, barley and even dry pasta. They are inexpensive and of course, available everywhere. But just remember, at some point or another you will want to (and you should) wash your blanket. This might not go down so well for a few obvious reasons. You know that adding water to these edibles will expand them through the absorption process, leaving you with one big soggy mess. They’ll also take forever to dry out, that is if they do. And if you’re that lucky, you’ll probably end up with a very strangely deformed blanket. If you aren't lucky well... You'll wake up sleeping in soup. The most significant disadvantage with food fillers is that they’re delicate, susceptible to mold, fungus, bacterial growth and insect infestation, and at some point, they will expire and rot. Not a pretty picture. So, I don’t suggest going this route unless maybe you’re doing a fun science project. Or just want your blanket to last a month (or three if unwashed). Based on all this information, I'd say you're probably better off using a long-lasting, durable, non-organic weighted blanket filler that won’t give you any hassles when trying to use, wash or store it. Do you have to be careful with weighted blankets containing toxic chemicals? The ‘poly’ in plastic poly pellets, stands for Polypropylene. A chemical compound that’s an artificial resin which is a polymer of propylene. It does have other uses such as in films, fibers, threads, or casting materials. I know what you must be thinking. These plastic pellets must be covered in fire retardants, preservatives, PBA’s, plastic by-products and a whole range of other toxins and substances. And yes, you may be right. With every non-natural product there is always the risk of toxicity but fear not, there is a bright side. With strict regulations these days, manufacturers are obligated to follow strict guidelines and safety procedures during the manufacturing process. Therefore, most commercially distributed fillers tend to be nonhazardous, chemical free, PBA free, hypoallergenic and safe to use externally. For your peace of mind, you could ensure these items have been FDA approved by reading the label before you buy. Bear in mind though, that with anything inorganic and unnatural, like plastic and glass beads, you must keep them away from children and they are certainly not safe to be ingested. Sand and preservative treated food fillers also fall into the "unsafe to eat" category, so be aware of that too. 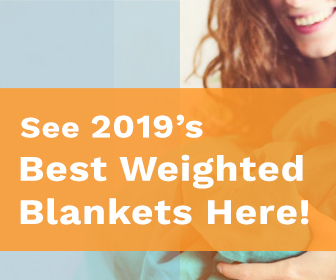 I've put a lot of research into finding out which manufacturers have the best weighted blankets in the market in 2018, so do check them out if you are looking forward to buying one! Do weighted blankets really help with insomnia and anxiety ? do you know any research done about that topic ? I am on my third nigh and I LOVE IT. I could tell a difference the first night! Where is the best place to buy the appropriate size of steel shot? can I use crushed buckwheat? I am wondering why you recommend the blanket be washed frequently. If it was treated like a duvet and used in a cover would it not stay clean? I was thinking of making one with rice as the filler. Depends on how you’re using it. If it’s just being used on your bed it would probably be fine – but if you’re using it in front of the TV and might spill food / drink etc. on it, you may need to wash it even if you’re using it within a cover (which is a good idea btw). Maybe you could give it a shot with rice and see how it holds up for you. All the best with it! Have you ever heard of anyone using crushed walnut shells? Hey Christen, no sorry – unless they were very finally crushed the sharp edges might be a bit problematic. Thanks! I make and sell weighted blankets. I use small pebbles and poly-fil to fill the blankets. Keeps the cost down and they are more eco friendly than plastic. I understand the advantages of using the poly pellets, but aren’t those extremely bad for the environment? Those pellets are going to be around many, many years longer than anyone who will be using the blanket. Washing the blanket does not have to be an issue. The weighted part of the blanket should be an insert that can be removed when the cover is washed. You could even have more than one cover. I think I’ll try rice or lentils. Hey, if ever there’s a disaster, my family will have a source of food! Has anyone tried using aquarium rocks for filler. And could it be washed in the washing machine.